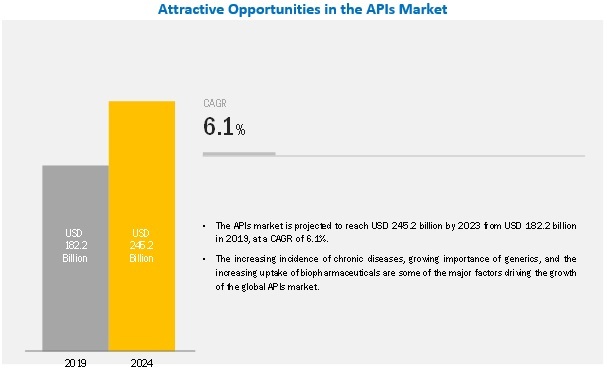 [253 Pages Report] The global APIs market is estimated to reach USD 245.2 billion by 2024 from USD 182.2 billion in 2019, at a CAGR of 6.1% during the forecast period. The increasing incidence of chronic diseases, growing importance of generics, and the increasing uptake of biopharmaceuticals are some of the major factors driving the growth of the global APIs market. On the other hand, the unfavorable drug price control policies across various countries and the increasing penetration of counterfeit drugs are expected to restrain the growth of this market in the coming years. In 2019, the prescription drugs segment is expected to account for the largest share of the APIs market. Based on the type of drug, the APIs market can be classified into two segments prescription drugs and over-the-counter (OTC) drugs. In 2019, the prescription drugs segment is expected to account for the largest share of the APIs market. The demand for drugs falling under this category has increased significantly in recent years due to the rising prevalence of target diseases. Additionally, the largest share of the prescription drugs segment can also be attributed to the increased focus of innovator companies on the development of specialty drugs and affordability of healthcare. The implementation of significant federal reforms to improve the affordability of healthcare, especially in the US, has expanded the consumption of both traditional and specialty drugs. Also, inflation has played a key role in enhancing revenue from the sales of prescription drugs, particularly specialty drugs. All these factors are collectively responsible for the large share of this segment. The captive API manufacturers segment is expected to account for the largest share of the global APIs market in 2019. Based on type of manufacturer, the APIs market can be divided into captive API manufacturers and merchant API manufacturers. In 2019, the captive API manufacturers segment is expected to account for the largest share of the APIs market. This can be attributed to the fact that most big pharmaceutical companies possess their API manufacturing facilities and are vertically integrated across the pharmaceutical supply chain. Moreover, innovator companies prefer in-house manufacturing of innovative products to avail economic benefit and prevent technology leakage. The mammalian expression systems segment is expected to account for the largest share of the biotech APIs market in 2019. On the basis of expression system, biotech APIs can be categorized into mammalian expression systems, microbial expression systems, yeast expression systems, insect expression systems, and other expression systems. The biotech APIs market, by expression system, is dominated by mammalian expression systems owing to their ability to achieve the highest level of post-translational modifications and efficient protein folding, which makes them suitable for human use. North America is expected to account for the largest market size during the forecast period. Geographically, the active pharmaceutical ingredients market is segmented into North America, Europe, Asia, and the Rest of the World (RoW). In 2019, North America is expected to dominate the market, followed by Europe. The major factors driving the overall growth of the APIs market in this region include the growing incidence of preventable chronic diseases, increasing government focus on generic drugs, rising demand for biologics and specialty drugs, and technological advancements in the manufacturing processes of APIs. This market segment is expected to grow at a modest rate due to a combination of economic and healthcare severity measures and the introduction of low-cost, generic versions of branded drugs. The global APIs market is competitive in nature, with several big as well as emerging players. The prominent players in the market are Pfizer, Inc. (US), Novartis AG (Switzerland), Sanofi (France), Boehringer Ingelheim (Germany), Bristol-Myers Squibb (US), Teva Pharmaceutical Industries Ltd. (Israel), Eli Lilly and Company (US), GlaxoSmithKline plc (UK), Merck & Co., Inc. (US), AbbVie Inc. (US), F. Hoffmann-La Roche Ltd. (Switzerland), and AstraZeneca plc (UK). Pfizer is one of the leading players in the APIs market. The leading position of the company is majorly attributed to its exhaustive product portfolio. The company has a strong brand image, which gives it a competitive edge over other players. In order to remain competitive and strengthen its market position, the company primarily focuses on adopting both organic and inorganic growth strategies such as agreements, partnerships, collaborations, product approvals, and acquisitions. In accordance with this, in June 2016, Pfizer acquired Anacor Pharmaceuticals, Inc. (US), a leading biopharmaceutical company developing small molecule therapeutics. In January 2018, Pfizer entered into a collaboration with Sangamo Therapeutics, Inc. (US) for the development of a potential gene therapy to treat amyotrophic lateral sclerosis (ALS). In May 2018, Novartis acquired AveXis, a clinical-stage gene therapy company, to develop a gene-based treatment for spinal muscular atrophy. In January 2018, Sanofi acquired Ablynx, a biopharmaceutical company to strengthen its platform for growth in rare blood disorders. In January 2018, Sanofi and Alnylam Pharmaceuticals, Inc. (US) announced a strategic restructuring of their RNAi therapeutics alliance to streamline and optimize the development and commercialization of products prescribed for the treatment of rare genetic diseases. What types of annual and multi-year partnerships are API companies exploring? Which are the recent contracts and agreements key players have signed? What are the recent trends affecting the API manufacturers? 13.6 Teva Pharmaceutical Industries Ltd.
13.9 Merck & Co., Inc. The study involved four major activities to estimate the current size of the global active pharmaceutical ingredients market. Exhaustive secondary research was done to collect information on the market, its peer markets, and its parent market. The next step was to validate these findings, assumptions, and sizing with industry experts across the value chain through primary research. Both top-down and bottom-up approaches were employed to estimate the complete market size. Thereafter, market breakdown and data triangulation were used to estimate the market size of segments and subsegments. Secondary research was mainly used to identify and collect information for the extensive, technical, market-oriented, and commercial study of the global active pharmaceutical ingredients market. Secondary sources include directories; databases such as Bloomberg Business, Factiva, and Wall Street Journal; white papers; and annual reports were also used to obtain key information about major players, market classification, and segmentation according to industry trends, regional/country-level markets, market developments, and technology perspectives. The revenue generated from the sale of active pharmaceutical ingredients by leading players has been determined through primary and secondary research. After arriving at the overall market size from the market size estimation process, the total market was split into several segments and subsegments. To complete the overall market engineering process and arrive at the exact statistics for all segments and subsegments, data triangulation and market breakdown procedures were employed, wherever applicable. The data was triangulated by studying various factors and trends from both the demand and supply sides. To track and analyze competitive developments such as partnerships, agreements, collaborations, joint ventures, alliances, mergers & acquisitions, approvals, expansions, and R&D activities in the global APIs market. Type, type of manufacturer, type of synthesis, type of drug, therapeutic application, and region.